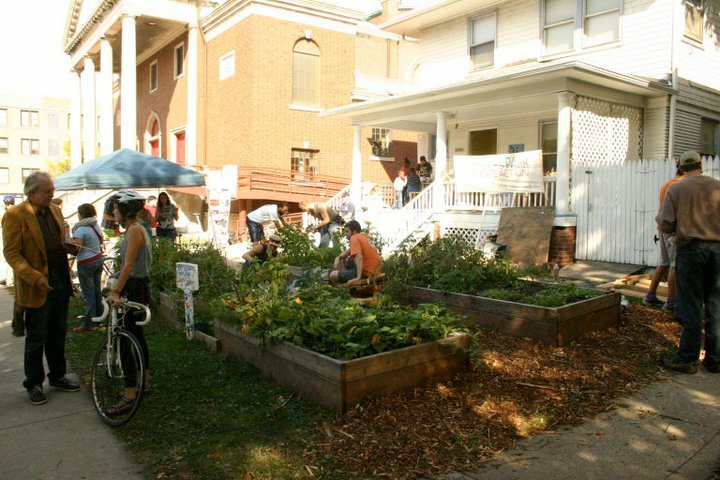 Leading the Energy Transition, Sprouting Green Opportunities (LET’S GO Chicago) developed out of a synergy between a youth garden program and the founding of a community house in Chicago in the summer of 2010. In its initial year, the program taught twenty neighborhood children how to grow food in the front yard of a house owned by United Church of Rogers Park while developing sustainability solutions for the property as a whole. Four years later our Children’s garden is still a staple within our organization, but the playground of our programming has expanded and evolved with exciting new initiatives. We serve as one of 16 Summer of Solutions programs hosted by Grand Aspirations, a national youth-led organization that empowers, connects, and supports youth leaders as they create innovative, self-sustaining, and inter-dependent initiatives that integrate climate and energy solutions, economic security, and social justice. Rural Agricultural Project at the White Rose Catholic Farm in Monee, IL. We are partnering with the Catholic Workers of Chicago to expand our roots just south of Chicago. Typically, we have brought the gardens to the people, but this program allows us to bring the people to the garden! We will be using the farm to teach city dwellers about rural agriculture, and much more! Follow our story — let us know what you think! Rogers Park has been noted as one of the most diverse neighborhoods in the country. That says a lot for the possibilities of building an inclusive movement for sustainable community change. We are uniquely positioned here because of the tremendous potential for diverse community outreach as well as the incredible interactions that result from building relationships with people from all over the world. Through the support of our friends and neighbors, we hope to foster change by inviting everyone to collaborate and share the journey of creating a viable future for us all. Interested in getting involved or donating? Contact team@letsgochicago.com for more information!